Financial planning is an implement which allows evaluation of the current financial situation of the organization and predicting of its future financial performance. One of the objectives of the financial planning is to determine funds requirements and capital structure in order to understand the financial soundness of the organization. In addition to it, financial planning process helps the organizational management in framing of the financial policies for the control of the cash flow as well as in ensuring that the organization is employing its financial resources in the most efficient manner. Further, the financial planning demonstrates the direction of the organizational activities and analyses how each action has its influence on the financial stability of the organization. Also, financial planning helps the organizational management to make a decision about investments since it shows different ratios (such as equity ratio, debt ratio etc.). These ratios play an important role in the decision making process. Financial plan consists of four elements. These elements are (i) profit and loss projection, (ii) projected balance sheet, (iii) projected cash flow, and (iv) break-even analysis. These four elements are shown in Fig 1. Profit and loss projection presents the plan of revenues and expenses of the organization over the specific accounting period. Profit and loss projection follows the same pattern as the profit and loss statement. Nonetheless, it reflects the data about the future. The presentation of the profit and loss statement differs from organization to organization. However, the basic structure includes the basic five measures namely (i) gross profit, (ii) operating profit or earnings before interest and tax (EBIT), (iii) operating profit or earnings before interest, tax, depreciation and amortization (EBITDA), (iv) profit before taxes or earnings before tax (EBT), and (v) net income. ‘Net sales’ is a final value of sales which the organization has made after the deduction of allowances (such as damaged goods), returns and discounts. Net income is obtained after deducting from the net sales (i) the cost of goods sold, (ii) operating expenses, (iii) expenses on interest and depreciation, and (iv) taxes to be paid. Cost of goods sold is the direct cost of the item which was sold to the customer. Direct costs represent the production cost of the product and include costs of materials, labour, energy, and utilities. It also includes manufacturing overheads. Operating expenses are those expenses which the organization incurs on a daily basis, excluding the cost of the production. These expenses include such items as salaries and wages (including provision for gratuity, provident fund, and pension etc. ), costs of marketing and advertising campaigns, maintenance, rent, research and development activities, travel expenses, and regulatory fees etc. Interest expense shows the cost of the borrowed funds (such as lines of credit, loans, bonds) for the organization. Profit and loss account contains information about accumulated interest, but not actually paid or which will be paid in future. For the calculation of the net income, it is necessary to deduct tax on income from profit. The amount of different types of taxes to be paid includes local tax, state tax and central government tax. Calculation of the cumulative tax is required to be done for the determination of the net income. Net income is the last component of the profit and loss statement. It reflects the base profit of the organization within the estimated accounting period. Profit and loss projection allows predicting the financial health of the organization in the future and it’s potential. In addition, it also shows the weaknesses of the organization, and this helps to consider or reconsider the business plan of the organization in order to strengthen the profile of the organization. Projected balance sheet displays liabilities, equity of the owner and the assets which the organization is planning to have during the projected period of the financial plan. Balance sheet allows evaluating the amount of the short-term funds in order to have an understanding if the organization is able to pay long-term obligations. In addition, it helps to find out whether the organization is in a financially sound condition. This is done by analyzing level of borrowing and type of assets. The normal structure of the balance sheet includes current and long-term assets, current and long-term liabilities, and owner’s equity. The main rule of a balance sheet is that assets are to be equal to the sum of liabilities and the equity of the owner. Assets – Assets consists of current assets and long-term assets and presents net value held by the organization. Assets of the organization are generally listed in the order of liquidity. The current assets include cash, amounts receivable, inventories, prepaid expenses and others. Cash is the most liquid asset, and it is commonly presented as demand deposits or temporary investments. Amounts receivable are the amounts, which the organization is to collect, when some goods or services were sold on credit. Amounts receivable stays in the balance sheet until the moment the amount is received. However, it may become bad debt or loss if the amount is not received for a long period of time. The inventories under current assets are represented by the stocks of raw materials, store items and finished goods. It also includes work in progress. Prepaid expenses display the value of items which has been paid in advance (such as prepaid purchases). To conclude, the current assets are those assets which are expected to be converted into cash over very short period say one-year period. Net fixed assets (less accumulated depreciation) and gross fixed assets represent long term-assets of the organization. Fixed assets of the organization include equipment, machineries, buildings, vehicles and all other items which are needed for the running of the organization. All fixed assets except land are required to be depreciated every year and they lose their value. Depreciation is to be taken into account in the projected balance sheet in order to display expenses properly at the profit and loss statement projection. Gross fixed assets represent the original value, while net fixed assets display its value after depreciation. The relationship between gross fixed assets and net fixed assets is given by the equation ‘Gross fixed assets – depreciation = net fixed assets’. From this equation, it can be inferred that the net fixed assets are obtained by the deduction of depreciation from the gross fixed assets. Projection of total assets allows the organization to predict its profitability over the period of the plan and helps in creating a plan for the efficient usage of the assets of the organization. Liabilities – Liabilities also, like assets, consist of short-term and long-term liabilities. Liabilities account provides information about how much the organization owes to its creditor. Current liabilities include amounts payable, interest payable and current part of long-term debt. Interest payable represents the amount of interest on the debt of the organization and capital leases which the organization owes to the bank or lenders. The projected amount of interest payable predicts if the organization is going to be in danger because of the debt obligations or not. Second part of current liabilities, amounts payable, displays the purchases, made by the organization on credit. The last element of current liabilities is the current part of long-term debt and it is represented by the installment payments of the principal portion of long-term debt. The current part of long-term debt includes the amount which is normally due during the short term period. Long-term debt is the long-term liability of the organization, and it takes place when some financing of long-term assets is needed. Total liabilities represent the sum of the financial obligations of the organization, and its projection helps to understand the opportunities of the financial profitability available to the organization during the period for which the plans are being prepared. Owner’s equity – Owner’s equity is the capital which is available for distribution among shareholders. Owner’s equity includes retained earnings as well as common and preferred stock. Common stock is a security, which presents the ownership in the organization and includes voting rights. Holders of common stock (shareholders) receive the dividends and capital appreciation. Preferred stock combines debt (fixed dividends) and equity. Holders of the preferred stock do not have rights to vote. However, preferred stock is cumulative, and preferred shares’ dividends are paid before common shares’ dividends. Retained earnings represent the total net income which has been reinvested into the organization in order to expand the assets. The retained earnings are formed by deduction of dividends paid from net income. The projection of the retained earnings allows the organization to evaluate its financial stability during the period of the plan since these earnings may cover the debt or reduce the reliance on the other capital markets. Cash flow is a net amount of cash and its equivalents which flows in and out of the organization. Cash flow influences at the capability of the organization to settle with debts since the positive cash flow increases the liquid assets while negative cash flow decreases them. Projected cash flow evaluates the state of the future working capital as well as it determines whether there is a necessity of borrowings or not. Cash flow projection helps in the proper planning of the surpluses or deficits during the period for which the plans are prepared. It forecasts the cash income and the expenses of the organization and deals with these operations for the period of the financial planning. Surplus, which is due to the result of a positive cash flow, provides an opportunity for the organization to invest in a liquid accounts and reinvest into the activities of the organization. In order to prepare projected cash flow, it is required to identify the expected amount of cash which is expected to be received and spent. It is necessary to calculate and update the anticipated income and expenses on monthly basis since it increases the efficiency and credibility of the cash flow projection and ensures the positive cash flow. 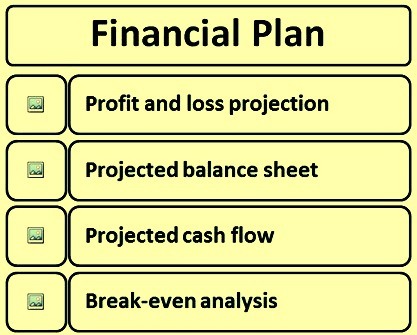 Break-even analysis is the fourth element of the financial plan. It identifies margin of safety for the organization based on the total revenue and total costs. It is a technique widely used by production management and is based on categorizing production costs between those which are ‘variable’ (costs which change when the production output changes) and those that are ‘fixed’ (costs not directly related to the volume of production). 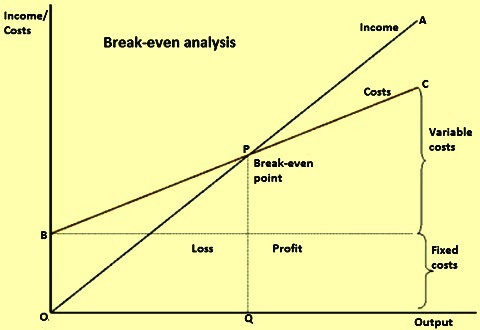 In break-even analysis, total variable and fixed costs are compared with sales revenue in order to determine the level of sales volume, sales value or production at which the organization makes neither a profit nor a loss (the ‘break-even point’). (Fig 2). Break-even point can be calculated by dividing fixed costs with difference between sales price per unit and variable costs per unit. This is represented by the equation ‘break-even point (in units) = fixed costs/ (sales price/unit – variable costs/unit)’. This analysis defines the sales volume and price level which are needed to cover the fixed and the variable costs. It allows setting a certain prices for the products/services in order to avoid losses.